Whilst 2012 closed with a whimper, 2013 starts with a BANG! as the fiscal cliff collapse crash mantra goes the same way as the Mayan doom prophecies barely of a fortnight earlier. Though don't worry there will be plenty more cliff-hangers for the always imminent crash merchants to hang onto during 2013 that I will seek to debunk during 2013, unless that is the actual probability of such events is high. But before looking ahead towards the prospects for the likes of the stocks stealth bull market for 2013 and other markets such as housing and commodities, this is a look back at a selection of the 10 most popular articles of 2012. The final countdown to the U.S. presidential election has now begun with expectations that there is little that each candidate can now effect on the electorate during the remaining 10 days. Most opinion polls currently put Romney slightly ahead of Obama i.e. ABC 50/47, BBC Poll of Polls 49/47, Gallop 48/48. However the high margin of error of as much as +/ -5%, and typically +/ -3% compounded by the electoral college system makes all of these opinion polls unreliable in trying to determine the US election outcome, therefore this analysis is focused on key events that impact on determining a probable forecast for the US presidential election 2012. The mainstream press were persistently painting a picture of the race between Mick Romney and Barack Obama being tight, however in terms of probabilities there was never really any doubt for several months that Barack Obama was by far the clear favourite. This analysis continues on from my last article in light of the recent French and Greek elections where voters rejected economic austerity in favour of money printing Inflation stealth debt default as politically an smoke and mirrors Inflationary depression is being seen as far more palatable for populations than a deflationary depression slow motion economic collapse. However to be able to print money inline with the true state of the respective competitiveness of euro-zone economies, then these countries governments have no choice but to exit the euro-zone, or be forced out as they one by one fail to follow through on agreed austerity measures. I am surprised that Greece has managed to hang in their and by virtue of which so has Spain because fundamentally things are now even worse for the Euro-zone, what this suggests to me is rather than a few countries going down, the whole euro-zone is hell bent on self-destruction, which is something that I will seek to cover in-depth during 2013. The Biblical story is told of a tower built ever higher in order to achieve contact with the heavens, lest they be scattered upon the earth. They were scattered when the tower fell. Fast forward to today, where the earth has a multitude of tribes, languages, and several major alphabets. When the Lehman Brothers failure occurred, and the Fannie Mae and AIG activities were to be concealed under court orders, the land turned barren, and a financial plague befell the Western nations led by the United States. They were after all, the keepers of the ark (printing press for USDollars). But a plague of debt locusts was cast upon the US nation, with annual $1.5 trillion deficits. The Americans in their unending arrogance, chose to speak from the tower top and to proclaim 0% forever, suspending gravity. They have attempted to force free money to finance their USGovt debts, to preserve power, to ensure privilege, but in doing so they defy nature in testing gravity itself. The consequences of central banks buying their own government bonds has yet to unravel for most non Euro-zone countries, the UK, US and not forgetting Japan are printing ever larger debt mountains the consequences of which IS inflation. On June 12, a leaked copy of the investment chapter for the Trans-Pacific Partnership (TPP) was made public. This copy was analyzed by Public Citizen’s Global Trade Watch and has been verified as authentic. This agreement has been negotiated IN SECRET for 2-1/2 years and no information has ever been released until this leak. So why have the details of this negotiation been so secret? This agreement has been framed as a “free trade” agreement and yet out of 26 chapters only two have anything to do with trade. The other 24 chapters grant new corporate privileges and rights, while limiting governments and protective regulations. Were you cursing at your computer screen when silver nearly tripled during the short 9 months from September 2010 to May 2011? Silver at $20 seemed like an insurmountable threshold for quite some time. This caused many silver investors to give up just prior to the ascent, completely missing the ride towards $50. I believe silver is about to offer a similar ride. While it is unlikely to match the 180% advance mentioned above, look for silver to make new highs in the coming months, with the potential to double to $65 by year end. Silver started the year at $29 and ended at about $30, so...., 2013? 6. How will China's Pan Asian Gold Exchange Revolution​ize Gold and Silver Trading? PAGE which stands for Pan Asian Gold Exchange was set up in 2011 and has already begun operations with local Chinese buying and selling of gold through the internet. PAGE is located in Kunming, the capital city of Yunnan Province located in South Western China and is also the major gateway to South East Asia. This gold exchange will enable ordinary Chinese buy/sell gold using a Renminbi account with a bank or broker. Currently there are two banks that are authorized to process the transactions or settlements and they are the Agriculture Bank of China and The Fudian Bank of Yunnan. The 10 ounce mini contracts will be known as T+D and the price is RMB 30,000 for 1 lot and it is fully backed by the Chinese government. 7. The Quantum of Quantitative Easing Inflation is Coming! The City of London is Imploding as a consequence of ever escalating shockwave's mostly emanating from across the Atlantic as the United States goes into overdrive in attempts to wipe-out competition from London in terms of profiting from global financial market transactions. 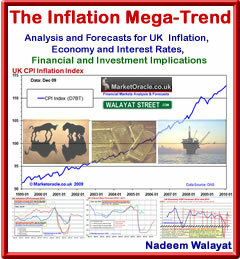 Was a reiteration of the warning to ignore the deflation fools as UK Inflation was expected to take off again (which it did) as a consequence of the policy of QQE, which basically amounts to the effective cancellation of UK government debt as the Bank of England returns interest payments on the Government bonds it increasingly holds. The world will end on 21st December! Or so the Mayan calendar supposedly predicts, though is vague on what the actual mechanism for our extinction will be, with the hot money betting on being hit by a rogue planet called Nibiru, whilst many academics argue that the Mayan calendar actually does not predict that the end of world but the end of one cycle and the beginning of another. However these theories have not filtered through to the masses many thousands of miles away in places such as China where some are going so far as building arks to ride out the end of the world, in Russia selling doomsday kits, in France closing access to mountain passes to avoid panic amongst people fleeing to the mountains. Nobody really took the Mayan Prophecies seriously, after all they never saw their own demise a thousand years earlier. Still it did give a window into the construct of religions as a means of control that appears to be genetic and a trend which humanity is still marching towards i.e. the all seeing and all knowing all powerful state seeking to control every action of people. 9. Stocks Stealth Bull Market Riding Tsunami's of Debt Crisis Fears to New Highs, What's Next? The stock market last closed at another new bull market high at Dow 12,950, and within easy imminent touching distance of breaking above 13,000, whilst the debt crisis news out of Europe and elsewhere keeps worsening despite desperate attempts by European politicians to paper over the cracks as Greece marches inexorably towards the Euro-zone exit as each month the amount of debt write off demanded continues to climb from originally 20% to 53.5% (nominal, actual is probably 70%) today towards an eventual 90% default because the focus so far has been wholly on privately funded debt that has yet to touch on the additional Euro 200 billion or so that the euro-fools have so far thrown into the Greek debt black hole during the past 2 years to buy time for their own bankrupt banks. My expectations remained for a trading range for the whole of 2012, as I expected the maturing bull market to unwind accumulated speculative interest during the preceding 3 year bull run off of the March 2009 lows. (Interviewed by Louis James, Editor, International Speculator) : L: Doug, a lot of readers have been asking for guidance on how to know when it's time to exit center stage and hunker down in some safe place. Few people want to hide from the world in a cabin in the woods while life goes on in the mainstream, but nobody wants to get caught once the gates clang shut on the police state the US is becoming. How do you know when it's time to go? Illustrates the fears at the back of many peoples minds. The exponential inflation mega-trend remains as the underlying driver of all market and economic trends (as measured in fiat currencies) that is the consequence of all governments perpetual debt and money printing as the party of government always seeks to to buy votes to stay in power that the ever expanding levers of government aim to fulfill (public sector / central banks). And official CPI Inflaiton is subject to government and central bank fraud as they seek to under report real inflation rates, furthered by delusional deflationists who focus on even more subverted inflation indices that they label as 'core' inflation that tends to exclude major costs such as food and fuel despite the fact that most families spend over 50% of their earnings on such expenditures, all so as to fit within their delusional academic non existant deflationary economic world views. The bottom line remains which is to search out assets / commodities that have under-performed against the inflation mega-trend which will increasingly become prime for their own multi-year leveraged bull runs. An example of such markets as I have been suggesting for much of 2012 are the US and to a lesser extent the UK housing markets that readers of my articles have been given a near years head start upon and that I will seek to focus upon in-depth this month. Ensure you are subscribed to my always free newsletter to get the in-depth analysis and detailed trend forecasts for stocks and hosing markets for 2013 and many years beyond in your email in box. Also subscribe to our new youtube channel for video versions and additional educational material. I wonder if you could elaborate why you think the UK housing market is set ("to a lessor extent than the U.S. housing market") to experience a multi year leveraged bull run. I have just looked at sterling accross a range of fiat currencies and it does not look good in the medium term. In fact, I would say the UK is being primed for another quite significant devaluation in it's currency. Perhaps, the powers that be are pretty scared as we have witnessed even the queen assessing our gold reserves (or lack thereof) and Cameron coming out trying his best to indicate his coalition and to a greater extent UK plc is still "fit for purpose". I would suggest otherwise. In fact, why would any country in the world continue to want to hold Sterling as a foreign reserve or Sterling within the B.I.S under some special drawing rights scam. I would suggest that sterlings likely fall will spark real panic in the markets and we will see interest rates climb significantly. How then when the majority of people are on standard variable rate mortgages will they be able to afford a new panic cycle of significantly higher interest rates on their mortgages and still see a housing bull market materialise? I would suggest we have been living on borrowed time and will likely experience a similar europe style housing market crash, with lower real wages and a significantly lower standard of living. Mortgages are basically a leveraged debt product. If people's real wages are not increasing and access to cheap debt products start to dry up, please tell me how you see a sustained bull market in UK housing please? I do not believe foreign investors will take up the slack of previous UK buyers, despite their stronger currencies, do you? In fact, I travelled up North recently and I could not believe how many properties were up for sale. I wondered whether these were forced sellors despite relatively cheap access to borrowing currently. What on earth is likely to happen if borrowing costs increase significantly as sterling falls off a cliff? Even Waitrose CEO came out the other day and forecast yet still higher food prices to come. I couldn't help wondering whether he knew very well that sterling is being primed for significant falls accross a basket of currencies yet again. You only have to look at how GBP has done against AUD, NZD and CHF to name but a few to see where the trend lies. What do we produce anymore accept specialised products and services. Everything else seems to be owned by european countries, the U.S. or Asia. I wonder how far our wages will have to fall (and how far house prices will fall as a result) in order for us to regain some competitivesness on the world stage again? The trend so far certainly does not look good right now, does it? I would also suggest the peak of the housing market cycle was reached in the UK back in 2007/2008. It is very unlikely we will see real housing prices increase for a substantial number of years yet based on the longer term housing market cycles. Anyway, I would be interested to hear your thoughts to the above. I will be doing the opposite. Realising decade long gains in the UK housing market and parking my money outide of increasingly insignificant Great Britain. George Orwell...you had great foresight! 2. The Powers that be want a sterling devaluation what they fear is higher interest rates i.e. ratings downgrades. 3. How ? That is a secret ;) I have written an draft article that explains how but it needs to be posted in sequence. During which time many people were in denial, but now the same people cannot imagine house prices rising, but they will. House prices are based on supply, income and interest rates. The only way house prices are going to go up is if interest rates remain low for the next few years and/or incomes rise as interest rates rise. Your previous posts have always concluded that you expected interest rates to rise much sooner than they did not. (I know I'm being a bit picky, as your track record has been far better than most). Therefore, I can only conclude that you now expect further distortions in interest rates through QE for the next few years and then higher incomes (and higher interest rates) thereafter. Please correct me if I am wrong in this assumption. Supply does favour house price increases but that on it's own is not enough in my humble opinion! Once again thank you for your comments and the cryptic analogy yet to be revealed. I still believe however that there are other world markets which are more beneficial to one's wealth than the UK markets. At least if you buy rising assets in a stronger country you benefit from a stronger currency too. A rising UK housing market is mitigated with a devalued currency. Therefore, if one must live in fascist Britain (mussolini's definition not mine), I would suggest gold is a much better investment into 2016 than UK housing. However, every asset has it's peak and this relates to gold too. I expect 2016 to be gold's peak and gold to break out of it's trading range/consolidation in the next few months -no later than August 2013. Singapore and Australia have outperformed the UK on both housing and currency levels since 2008. Imagine owning assets in either one of these countries and comparing these price rises in GBP today! Why do people always insist on investing in the weaker markets when everything about trading/investing should be to do with investing in the strongest markets or currencies with the strongest trends? Surely, this makes more sense? Anyway, rant over. Sorry if I appeared rude above or in first post. Was not my intention.